Fig. 9.2. Maize production worldwide 2007 (data from FAOSTAT, 2009; map drawn by Dave Hodson, CIMMYT). Table 9.1. 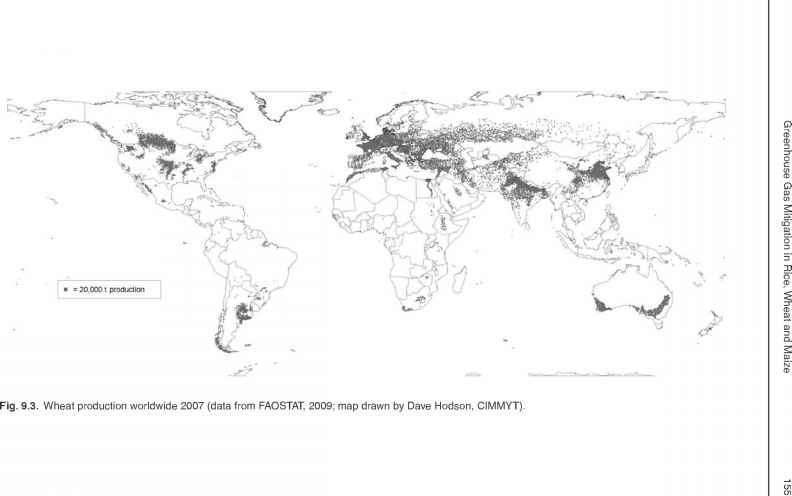 Assessing mitigation potentials in agriculture (from Barker et al., 2007). a Assuming C prices up to US$100/t CO2-eq by 2030.
rice land is, at least temporarily, flooded. The flooding regime effectively determines all element cycles in rice fields and represents the prerequisite for emissions of the major GHG, CH4. The specific role of rice fields in the global CH4 budget has also led to several detailed reviews on this subject (Wassmann et al, 2004, 2007; Yan et al, 2005; Li et al, 2006) so the emphasis of this chapter is on some new insights derived from recently published data, namely on upscaling and mitigation. Flooding of fields is innate to irrigated, rainfed and deepwater rice, but duration and depth of flooding varies over a wide range in these ecosystems. Irrigated lowland rice is grown in bunded fields with assured irrigation for one or more crops/year. Usually, farmers try to maintain 5-10 cm of water ('floodwater') on the field. Rainfed lowland rice is grown in bunded fields that are flooded with rainwater for at least part of the cropping season to water depths that exceed 100 cm for no more than 10 days. Worldwide, there are about 54 million ha of rainfed lowland rice. In both irrigated and rainfed lowlands, fields are predominantly puddled (wet tilled) with transplanting as the conventional method of crop establishment. In flood-prone ecosystems, the fields suffer periodically from excess water and uncontrolled, deep flooding. About 11-14 million ha worldwide are flood-prone lowlands. In many rice production areas, rice is grown as a monoculture with two crops per year. However, significant areas of rice are also grown in rotation with a range of non-rice crops, including about 15-20 million ha of rice-wheat systems. The rice-wheat system comprises nearly 24 million ha of cultivated land in Asia. In addition, it has the added complexity that the rice crop is grown under flooded conditions while wheat requires well-drained soils. Mitigation strategies for this system are well covered by Wassmann et al. (2004). A general summary of the potential of different management practices in rice to mitigate GHG emissions can be found in Table 9.2. Reduction through fuel use (West Confirmed and Marland, 2002) Potential reduction through C sequestration (Govaerts et al. Numerous field observations confirming either no impact or increase aWUE, water-use efficiency; GHG, greenhouse gas. rainfed rice, have a lower emission potential than irrigated rice. Organic inputs stimulate CH4 emissions as long as fields remain flooded. In addition to management factors, CH4 emissions are also affected by soil parameters and climate. In spite of a growing number of field experiments on CH4 emissions from rice fields, the estimates are still attached to major uncertainties. Intensive field measurement campaigns have clearly revealed the complex interaction of water regime as the major determinant of emissions on the one hand and several other influencing factors on the other hand. Given the diversity of rice production systems, reliable upscaling of CH4 emissions requires a high degree of differentiation in terms of management practices and natural factors. Modelling approaches have been developed to simulate CH4 emissions as a function of a large number of input parameters, namely, modalities of management as well as soil and climate parameters. In spite of considerable progress over recent years, the available simulation models for GHG emissions from rice fields need region-specific validations before they can be used for reliable computation of emissions. published the original guidelines in 1994 and revised them in 1996 (IPCC, 1997) and 2006 (IPCC, 2006); it has also published Good Practice Guidance and Uncertainty Management in National Greenhouse Gas Inventories (IPCC, 2000). In these efforts to streamline reporting of NIGs, the land use sector proved to be especially challenging. The entire IPCC guidelines are conceived as fairly simple protocols that allow countries (called 'Parties' in the UNFCCC context) to compute emission rates even if the level of information on the different sectors (e.g. land use) may not be all that detailed. Thus, it should be stated that these guidelines cannot be deemed per se as a scientific approach, but more like a standardized accounting scheme for emissions. Nevertheless, effectively all countries have formed national groups of experts to compile their NIGs and these have used the most reliable statistics (e.g. on land use) available in the respective countries. The IPCC guidelines distinguish between activity data, emission factors and scaling factors (see Table 9.3). The emission factors distinguish between Tier 1 (a global default value; to be used as long as there are no regional measurements available) and Tier 2 (based on emission measurement conducted in the respective country). Table 9.3. Terminology of IPCC guidelines for emissions from land use (IPCC, 2006). Specific factors for water management, organic inputs, etc. Fig. 9.4. Global warming potential (GWP) (from low to high per 1° grid cell and year) of crop production in South, East and South-east Asia: (a) CH4 emissions from rice production; and (b) N2O emissions from arable land (rice and other crops). See text for more explanations (map drawn by K. Sumfleth, IRRI). converted the units of the EDGAR database into GWP. 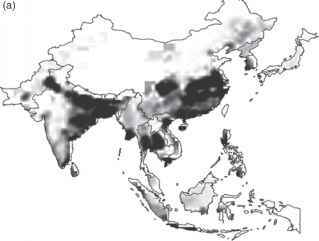 The CH4 rice map reflects distinct 'hotspots' in China and India as well as in South-east Asia. These hotspots in China, north-west India, Vietnam and the Philippines correspond to areas with high abundance of rice fields and dominance of irrigated rice. Eastern India, north-east Thailand and South Myanmar have a relatively high amount of rainfed rice (with a lower CH4 emission potential than irrigated rice), but the prevalence of rice as compared to other forms of land use marks these regions with high CH4 emission potential. Yan et al. 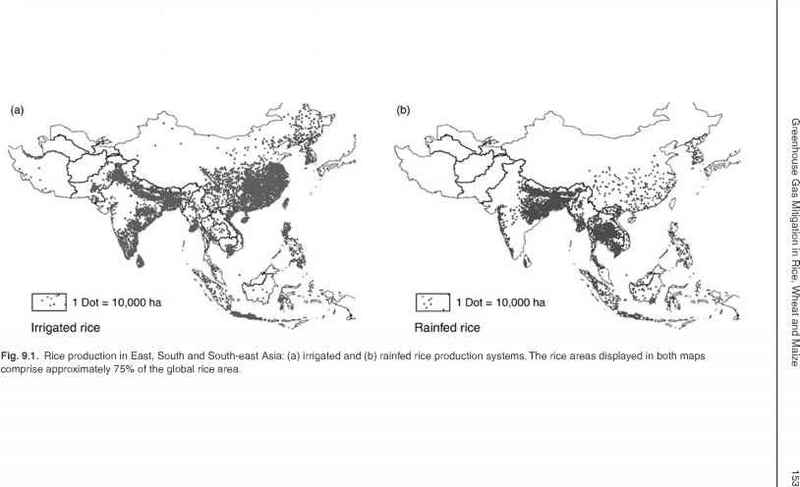 (2009) recently estimated the CH4 emissions from the global rice field based on the Tier 1 method described in the 2006 IPCC guidelines (IPCC, 2006) with country-specific statistical data regarding rice harvest areas and expert estimates of relevant agricultural activities. The estimated global emission for 2000 was 25.4 Tg/year, which is at the lower end of earlier estimates and close to the total emission summarized by individual national communications. These results are in line with other assessments of CH4 source strengths from rice fields. According to the latest summary by the IPCC (Denman et al., 2007), rice fields emit 31-112 Tg of CH4/year, about 12-26% of the anthropogenic CH4 sources, or about 9-19% of the global CH4 emissions (base years: 1983-2001). Many mitigation options for GHG emissions through field management in rice have been suggested. Yagi (2002) reviewed them for CH4 emission, broadly dividing them into four categories (water management, organic matter, soil amendments and others) and evaluated them from the viewpoints of mitigation efficiency, applicability, economy, and effects on yield, soil fertility and others. According to the result, the managements that keep soil conditions more oxidative, that allow organic matter decomposition under more aerobic conditions, and that use zero tillage seem practical in terms of cost and labour. Climate change and competition from industry and domestic usage will make stable and adequate supply of water more difficult even for the irrigated rice ecosystems. Therefore, the mitigation options of GWP of paddy fields through water management are particularly relevant. Mid-season drainage or intermittent irrigation, which prevents the development of soil reductive conditions, is considered to be an effective option for mitigating CH4 emissions from rice fields (e.g. Yagi et al., 1997; Nishimura et al., 2004). A statistical analysis of a large data set from Asian paddy fields indicated that, compared with continuous flooding, a single mid-season aeration can reduce the average seasonal CH4 emission by 40%, and multiple aeration reduces it by 48% (Yan et al., 2005). Li et al. (2006) estimated that, despite large-scale adoption of mid-season drainage, there was still large potential for additional CH4 reductions from Chinese rice paddies of 20-60% over the period 2000-2020 according to the DeNitrification and DeComposition (DNDC) model, a process-oriented model. Through the analysis, water management strategies appeared to be the most technically promising GHG mitigation alternatives, with shallow flooding providing additional benefits of both water conservation and increased yields. In addition, unflooded rice production has been proposed as a potential mitigation strategy (see Hobbs and Govaerts, Chapter 10, this volume). However, mid-season drainage or reduction in water use increases N2O emission by creating nearly saturated soil conditions, which promote N2O production (e.g. Zheng et al., 2000). There are reports that mid-season drainage both increased and decreased the net GWP of paddy fields. Cai et al. (1999) reported that the GWP of N2O emissions was even higher than that of CH4 emissions from Chinese paddy fields with mid-season drainage when large amounts of chemical fertilizer (364.5 kg N/ha) and farmyard manure (5 t/ha) were applied. Bronson et al. (1997) found that the total GWP of continuously flooded fields was lower than that of fields drained mid-season when no straw was applied, but it was higher when straw was applied. 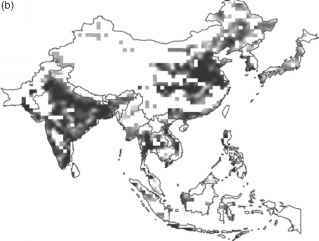 There seems to be accumulating evidence that mid-season drainage decreases the net GWP of paddy fields. In relation to N2O there is a summary of data by Akiyama et al. (2005) and an estimate using a statistical model proposed by Yan et al. (2005). These reports show that mid-season drainage generally tends to be an effective option for mitigating net GWP though 15-20% of the benefit gained by decreasing CH4 emission was offset by the increase in N2O emission. 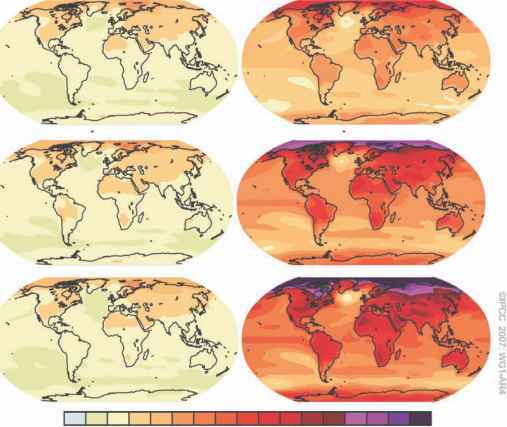 Based on the 2006 IPCC guidelines, Yan et al. (2009) estimated that the increased GWP resulting from the increase in N2O emission was only approximately 2.7% of the reduced GWP through CH4 emission reduction when all the continuously flooded rice paddies were drained more than once a rice-growing season. Li et al. (2004) reported that mid-season drainage reduces net GWP compared with continuous flooding; 65% of the benefit gained by decreasing CH4 emissions from rice fields in China was offset by an increase in N2O emissions, as determined by the DNDC model. We can conclude that, although there remains large uncertainty in N2O emissions, mid-season drainage has the potential to be an effective option to mitigate the net GWP from rice fields when rice residue is returned to the fields. However, there is a risk that N2O emission offsets reduction of CH4 emission or moreover brings higher GWP than CH4 emission when rice straw is not returned to the fields and when N fertilizer is applied at a high rate. The drainage timing and span of the conventional water management have been depending on the farmer's empirical knowledge and customary practices. In order to provide farmers with specific criteria for draining and watering, Minamikawa and Sakai (2005) proposed an 'Eh control' concept, where water is managed based on soil redox potential by providing a specific predetermined lower and upper limit to reduce CH4 emissions. The International Rice Research Institute (IRRI) has been developing and disseminating the alternate wetting and drying (AWD) irrigation management technique as a water saving technique. The AWD technique provides farmers with specific criteria of soil water for judging the timing of watering to avoid imposing drought stress on rice plants (Bouman et al., 2007). In addition, AWD reduces field water application by 15-20% without significantly affecting yield and increases the productivity of total water input (Tabbal et al., 2002; Belder et al., 2004). Using the concept of 'Eh control', IRRI is trying to develop a new AWD system that realizes high yield, water-saving and low GWP compatibly. One of the key prerequisites for the success of this approach will be the fine tuning of water and nutrient management. Excessive N doses trigger pulses of N2O emissions, and these losses will be exacerbated by concomitant shifts in the soil moisture regime. Thus, AWD should be closely linked to more precise diagnostics of N needs. Demand-driven N applications using leaf colour charts can substantially increase N-use efficiencies (Dobermann et al., 2002) and thus reduce N2O emissions by the means of lower N fertilizer requirements.